Whilst browsing various blogs, I came across this challenge that should be interesting. Should be interesting. Basically, topics will be sent out to you and you write about them twice a month. Quote from AnotherGirlyBlog "The topic ideas are there to give you new ideas and encourage you to write about things you wouldn't normally write about." I think this sounds like fun and it might get me blogging more regularly. I enjoy blogging and want to make the most of it. I read so many other blogs that I feel I should contribute some more. New follower from the 2014 blogger challenge. Can't wait to see what you have in store. Lovely blog - have followed. 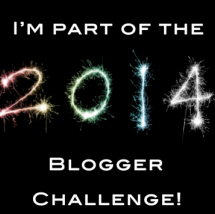 I see you are part of the BloggerChallenge 2014 as am I - can't wait to read some posts. Thanks for following you guys. Can't wait to write the first topic. Already having a think.